The world is waiting and watching closely. After delays, come March-April, the Indian Navy will induct two deeply anticipated surface combatants, both carrying on their decks a world of expectation and indigenous toil. 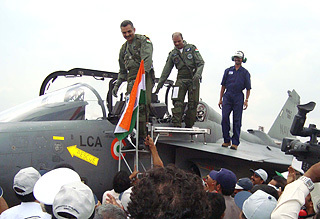 Indian Boomer in Service This Year? India’s home-built nuclear-powered ballistic missile submarine Arihant is all set to enter service with the Indian Navy by the end of this year, DRDO chief Dr Avinash Chander said on Day 2 of Defexpo. Apart from the Indian Navy’s medium range maritime reconnaissance (MRMR) competition, the Indian Coast Guard (ICG) is officially looking for nine multi-mission maritime aircraft (six initially, with options for three more). As Defexpo 2014 opens, the atmosphere in Delhi's early spring air is unmissable. In a country that has had a difficult relationship with military procurement, these are particularly testing times. Nearly four years after the Indian Navy first scouted information to support its acquisition of six new-generation diesel-electric attack submarines as part of Project 75 India, a request for proposal (RFP) remains tantalisingly elusive. With INS Vikramaditya settling in at home-base Karwar, it will soon be time for the crew, led by Commodore Suraj Berry, to set out to sea again. The Indian Navy's Hydrography Department has decided to upgrade its surveying capabilities by acquiring a new autonomous underwater vehicle that can be deployed off its existing and new hydrography survey vessels. In an unprecedented move signalling heightened cooperation with neighbours, India will export indigenously developed sonar systems to Myanmar, for use by its navy. The ninth edition of the Indo-UK naval exercise 'Konkan' was conducted successfully off the West coast of India earlier this month, with two frontline surface combatants from the two navies participating. The erstwhile Admiral Gorshkov aircraft carrier enters a new phase of its extended life on November 16 at Severodvinsk, Russia, when it is commissioned into the Indian Navy. The Indian Navy has announced interest in 15 mobile missile coastal battery (MMCB) systems for deployment at various locations along the country's coast to protect Naval bases and ships. On Tuesday, September 10, the Indian Navy's stealth frigate INS Tabar and fleet replenishment tanker INS Aditya, will dock in Doha, Qatar on a four-day diplomatic goodwill visit. The Indian Navy has called for professional help to salvage the INS Sindhurakshak submarine, which sank in its berth at the Mumbai dockyard on the intervening night of August 13 and 14.